LaMarcus Aldridge had a career-high 45 points, helping San Antonio overcome Donovan Mitchell's 35-point performance for Utah in the Spurs' 124-120 overtime victory over the Jazz on Friday night. To the Jazz, it’s obvious: he’s the Defensive Player of the Year. DALLAS — Utah Jazz players know that Rudy Gobert will be there when they screw up on defense, because Rudy Gobert tells them exactly that. When he doesn’t cover their mistakes, they’ll yell at him for breaking his promise — all in good fun, Joe Ingles says, while explaining this phenomenon to me. But they don’t get too many chances. Ask his teammates, and they marvel at Gobert’s incomparable length that seems to cover the entire paint. Ask Derrick Favors, and he’ll admit that he often thinks, “Rudy just saved my ***,” during games. Ask Jazz head coach Quinn Synder, and he’ll give a 90-second case for Rudy Gobert as Defensive Player of the Year. “Objectively, Rudy’s the guy,” Synder tells SB Nation. You know what? He might be right. The Defensive Player of the Year award has been muddied this year. The past two winners aren’t true candidates: Kawhi Leonard has missed nearly all of the season and Draymond Green hasn’t played up to his normal standards. A dark horse candidate, Andre Roberson, suffered a season-ending injury halfway through the year. Kevin Durant and Paul George have been propped up by flashes of brilliance more than consistency. Joel Embiid has been sensational, but he plays less than many his peers. Then there’s Gobert, who’s had 11-game and 15-game absences with injuries this season. If not for that, this award would like be locked up already — it would be hard to argue that anyone has been more outstanding than a healthy Gobert. But even his biggest apologists can admit those absences hurt him. 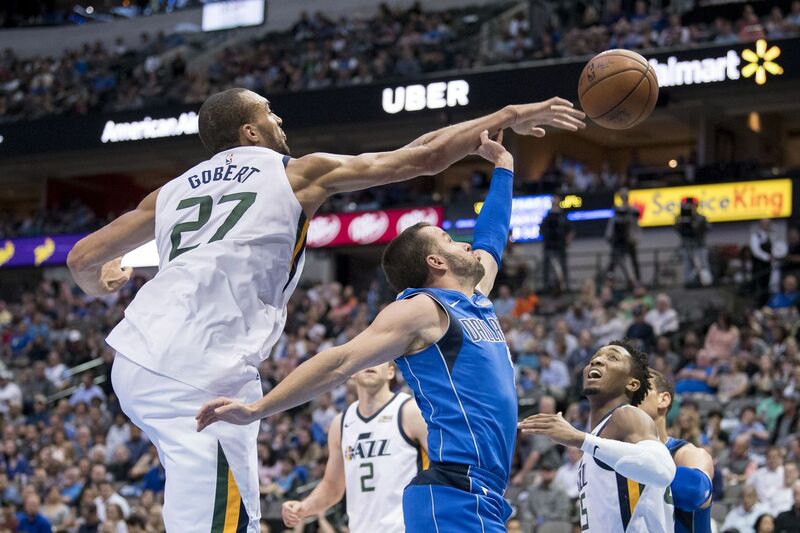 DALLAS — The Utah Jazz bounced back from a frustrating home loss two nights earlier to beat the Dallas Mavericks 119-112 at American Airlines Center on Thursday night. Turning point: In a game that saw the home team trail by as many as 21 points, the Mavericks used an 11-2 run cut Utah's lead to 115-109 with 1:17 remaining. Donovan Mitchell then gave Utah some breathing room, driving strong to the basket and made a runner while being fouled by Jalen Jones with 1:02 to play. Though he missed the free throw, it pushed the Jazz lead back to eight at 117-109 and Utah held on from there. 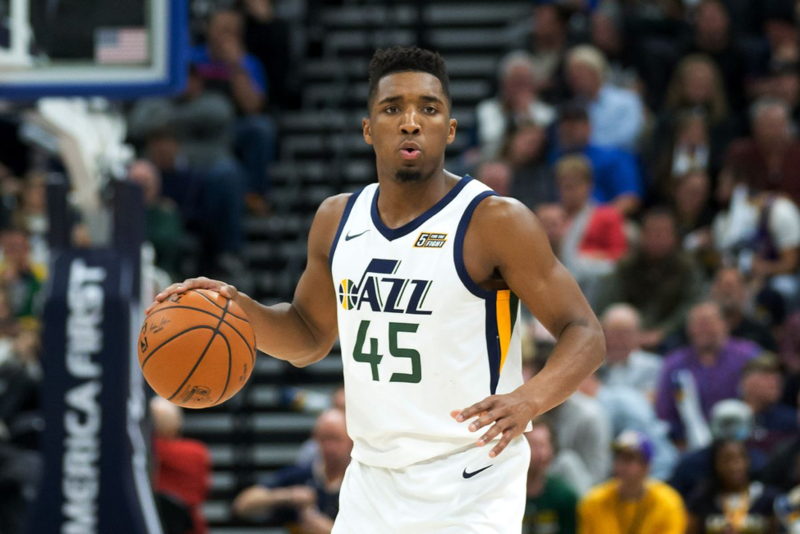 The heroes: Rookie Donovan Mitchell led the Jazz with 26 points, shooting 11 of 22 from the field, while adding five rebounds, four assists and three steals. Utah had six players in double-figure scoring, including Joe Ingles, who had a double-double with 18 points and 10 rebounds, and Ricky Rubio, who added 22 points, five rebounds, three assists and five steals. The Jazz outshot the Mavericks 52.9 percent to 49.4 percent from the field. Utah had 10 more assists, 32 to 22. The Jazz had 11 steals to five for Dallas. Western Conference update: Can we Jazz up the playoffs? After a 4-year drought previous to last season, it’s looking like the Jazz have a fantastic shot of back-to-back playoff berths. This is one crazy end of season stretches and the Utah Jazz are hanging on to their playoff hopes by the skin of their teeth. The 99-94 home-loss to the Atlanta Hawks on Tuesday was devastating. Just one game is the difference between being tied for the 5th seed with the New Orleans Pelicans and precariously riding the cusp at 8th place. Right now—as of Wednesday the 21st, the gap between the 3rd seed and standing just outside the door in 9th place is only 6 games. The only teams truly secure in their seeding are the Warriors and Rockets who currently have 57 and 53 wins respectively. Everyone else is neck and neck. The Portland Trail Blazers are 44-27. The OKC Thunder are 43-30. The Pelicans, Spurs, and Timberwolves are all 41-30. The Jazz are 40-31. So … as you can see, this Western Conference battle is the race of all races. The Jazz need to win as many as possible and we need a little help from those currently above to go on a bit of a slide. I say this because meeting the Houston Rockets in the first round isn’t optimal. The last time we’ve beaten the Rockets was back in early March of 2017. So far this season, the four meetings against Harden and crew have all resulted in double-digit losses.